I couldn’t figure out why the running board sat so high and the end pieces didn’t fit. I placed the pattern on an HO scale copy of the cross section and had the infamous “Oh crap!” moment. I had started this project back when Martin Lofton was still doing the Chicago area RPM’s. This is what happens when you pick up and put down a project repeatedly over several years. It gets screwed-up. I’m also upset that Tom Madden has been wasting his time casting these. Thirty tank castings went into the garbage. My middle son Patrick has offered to model the tank in 3D in order to fix the pattern. I was working to have these 10K kits available at RPM Chicagoland but that isn’t going to happen. This is a bad news/good news situation, so it’s not a complete disaster. There is good news to report! The new UTLX Class X 6.5K gallon tank car kit almost fell together in assembly. Our “best laid plans” to introduce two versions of this model have been shot down but at least we will have one of these available. We look forward to seeing many of you at the RPM Chicagoland event. We will have a limited number of the 6500-gallon cars for sale. The 10K cars are delayed. We will have more of the 6500-gallon cars available after the RPM and hope to introduce the 10K cars shortly afterwards. Additionally, many Resin Car Works orders received over the last month have been shipped! If you had placed an order in the last two months, you should be receiving it soon. Thank you for your patience! 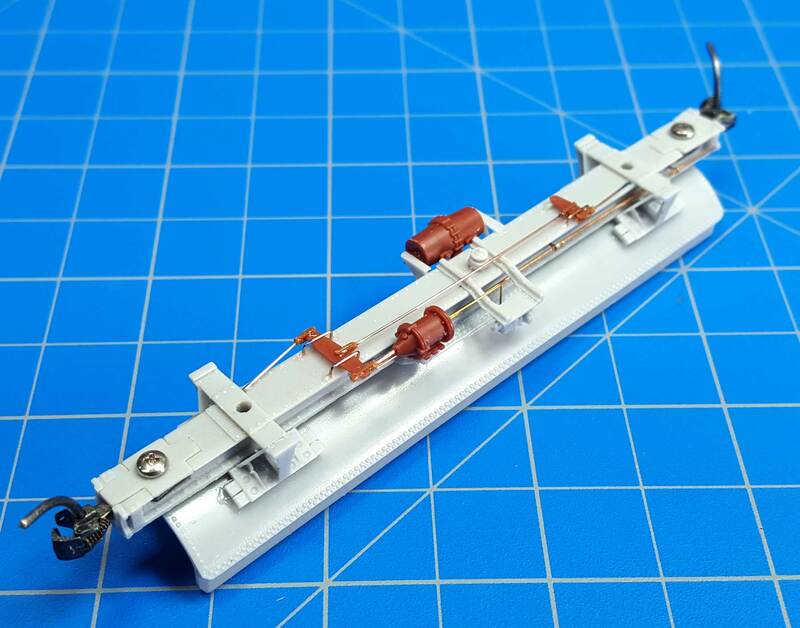 Thank you, Frank, for sharing a combined workbench report and Resin Car Works update. Purchased my kit today at the Lisle RPM. Immediately impressed with the engineering of this kit given the way a peg on the bottom sheet indexes into the center-sill making it a cinch to make sure the tank is located correctly and squarely on the center-sill. Long overdue with this type of kit. Not seeing the Instructions on the RCW website as yet however. I have a photo of two of the 6500gals in the sixties! (UTLX 58008 and 58041 in 1969 by Jim Sands). The side stirrup steps look amazing! Are they a single casting or a lot of .. aah.. scratch? I took a peek inside the box of the kit I bought in Lisle, and the sill steps are metal castings, probably from Precision Scale. It looks like this kit will be fun to build, and I’m sure it will become an outstanding freight car when finished. I held the tank up to a string of my other tank cars of various sizes, and the diminutive size of the 6.5 K car is readily apparent. Great addition to the roster. Nelson, yes the steps are Precision Scale castings. We are glad you like how it looks. Kit instructions will be posted to the RCW website this week. Frank and I couldn’t quite get everything done before the RPM. We will make a blog announcement when the Class X extras page with instructions and photos is ready for prime time. – Eric H.
Oops! But these things happen. I look forward to having both kits in my hands. Looking forward to the release of the 6,500 X car online. Can not make it to the Lisle RPM meet. More will be available soon, Dale. We will be posting kit info on the website and announcing it here on the blog when these kits are ready again. – Eric H.